Modern USB sticks are like the TARDIS – their capacities are now huge, while their outsides keep getting smaller. This has resulted in many of us keeping more important data on devices that have become easier to lose. If we lose these devices, our data – some of it potentially very sensitive – can easily fall into the wrong hands. All someone would need to do is pick up the device and plug it into their own computer. Conseal USB has been designed to completely protect data on USB devices, and it's easily one of the most secure USB encryption packages we've used. A dual lock AES-256 bit encryption system results in security that isn't entirely dependent on passwords – the PC also needs to also be connected to the internet. 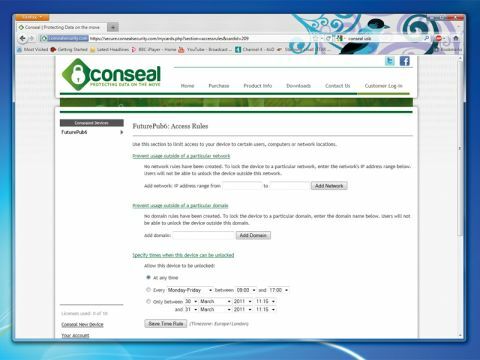 When you insert a USB stick with Conseal installed, you're prompted for a password. A small security file (or key) is then installed on the PC, pairing the computer with the USB device so that the drive can only be accessed from that machine. Logging on to the Conseal management console from any PC connected to the internet will let you see where and when your USB device has been accessed. The console gives you an incredible amount of control. You can set rules that limit what network the USB drive can be accessed from, and even dates and times when it can be used. You can also set up email alerts to inform you when your USB device is used. Even more usefully, you can remotely set the USB device to 'self-destruct' if it's lost or stolen. This wipes all the data from the device when it's plugged into a computer and accesses the internet. If the stolen USB drive is plugged into a computer that isn't connected to the internet, then it remains locked – a completely watertight and easy to use security system.